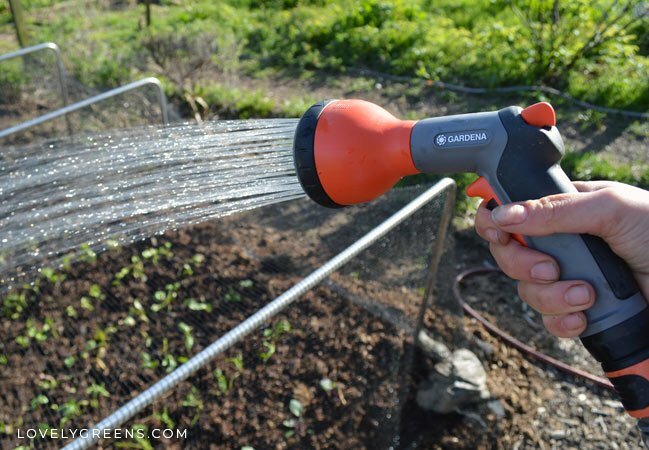 This piece is in partnership with Gardena, Europe’s leading brand of high quality gardening tools. In April they sent me their NatureUp! 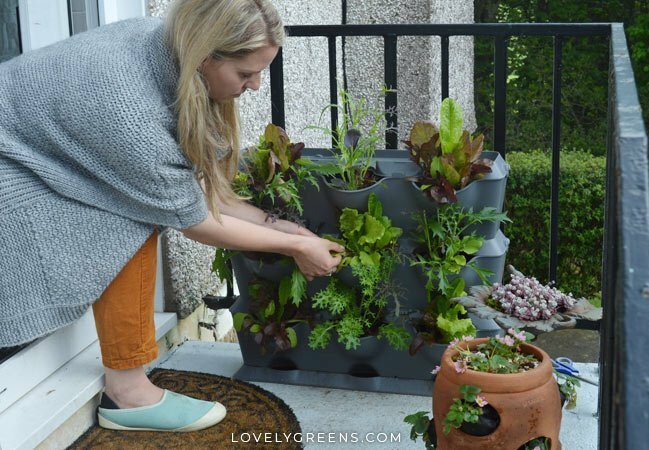 vertical planter and this month I’m pleased to add their Gardena AquaRoll M Hose Trolley to my gardening set up. It’s now late spring and green leaves seem to appear overnight — the salad season is in full swing! With all this sunshine, the garden veg is growing strong but I know that at the slightest hint of drought some of them will bolt. Many leafy green plants get stressed when it gets too hot or when they don’t have enough water. That’s why I’m keeping a close eye on moisture levels and have taken precautions against the soil drying out. Like all containers, the Gardena vertical planter that I have next to my kitchen door needs regular watering. It’s really great at draining excess water down to the bottom tray and the extra mulch of horticultural grit is helping retain moisture. 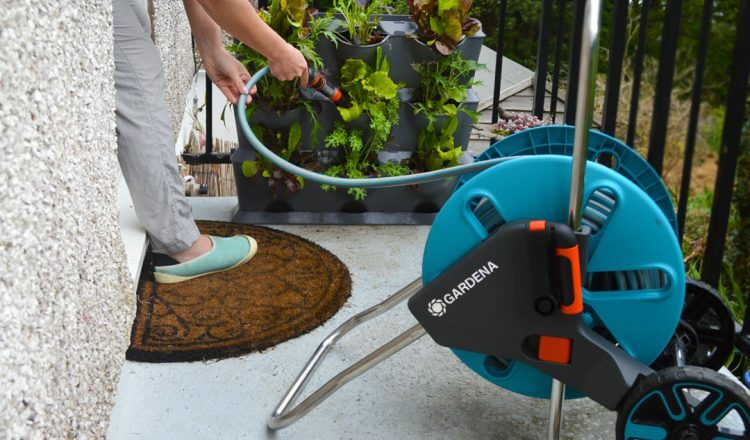 I now use the Gardena AquaRoll M Hose Trolley to water the plants all around my house, including the planter. It wheels around easily and I can hook it up to the tap by my back door as well as the one near the greenhouse. It saves having to have two hoses. I’m watering containers every couple of days in warm weather and when it’s cool it needs less. The salad greens I have planted in each of the vertical planter’s pockets won’t tolerate any drought though. At the smallest sign of water shortage they’ll bolt, sending up flower stalks. The leaves turn bitter after this and the plants have to be replaced. Keeping the planter in a visible place where I’m aware of it and able to check the compost daily means long-lasting salad greens. In the past three weeks my vertical lettuces have doubles in size. Right now I’m nipping outside every few days to take a few leaves from each plant at a time. It’s amazing how quickly the leaves grow back this time of the year. When it comes to containers and potted plants watering is a contentious issue. Getting moisture levels just right can be a challenge since if they’re not potted up with free draining material, water collects at their bases. If they’re not watered regularly enough, they can dry out. So with a lot of containers it’s a case of too much water or too little. The best way to make sure that plants thrive in containers is to pot them up well. 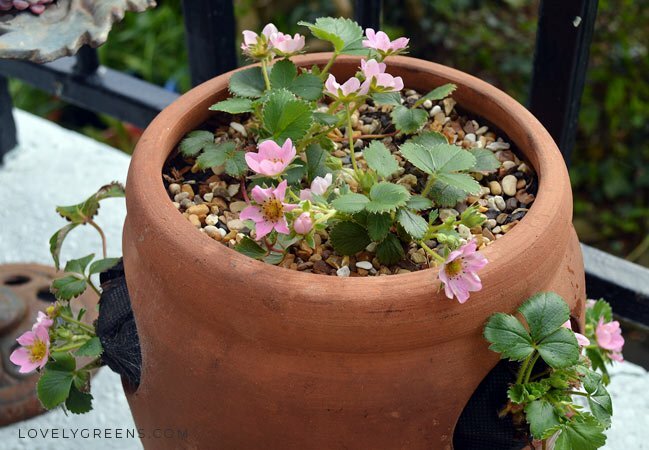 Crocks or gravel at the bottom of the pot help water to escape and using grit, perlite, or vermiculite in the potting mix are also a great idea. Once plants are potted up, the finger test can tell you if it needs watering. 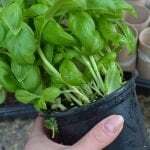 Dip your finger in the compost and if it feels dry, give the pot a drink. If it’s wet then leave it. Easy peasy. 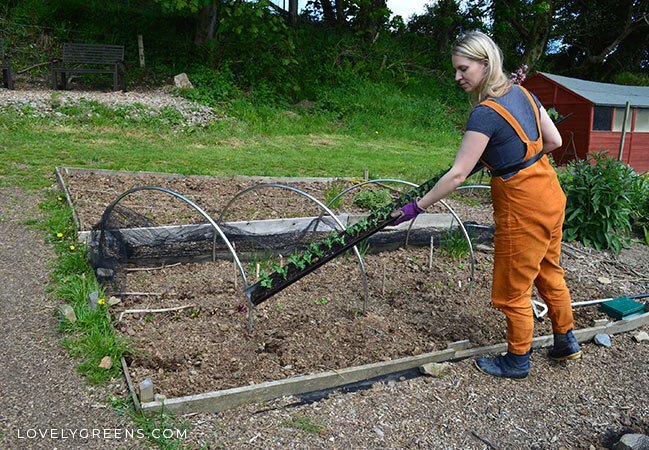 In my experience veg likes to grow in rich compost that retains water and drains freely. If you can get your hands on a bag of farmyard manure from a garden centre, you can use just that. There’s a lot more in it than just manure and the bits of composted wood and coarser materials creates air pockets and allows water to drain. Tomatoes grown in greenhouses need to have a constant moisture level so that means watering regularly. Without regular moisture, the chance of tomatoes suffering from blossom end rot increases. If your fruits are growing on the plant, there’s a chance of them splitting too. If the plant is thirsty and drinks up water after a mini drought then that water goes straight to the juicy fruit. It causes the skin to crack which in turn attracts insects. The fruit won’t last long after it splits either. Another important tip when watering greenhouse tomatoes is to always water the soil, not the leaves. Water on leaves acts like a magnifying glass in the greenhouse and can scorch the leaves. If you’ve ever seen little brown marks on your tomato leaves, it could be from water on the leaves. One way I avoid getting the leaves wet is by watering my tomatoes with a DIY Olla. These are just terracotta pots sunk into the compost and filled with water. 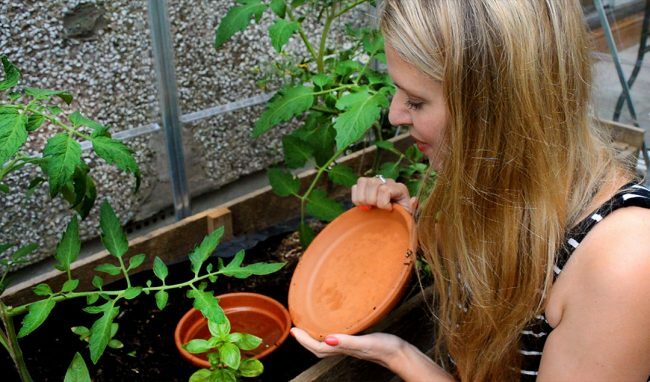 Water seeps through the pots and feeds the plant roots directly. There’s no point in just spraying a little bit when you’re trying to water the garden. When my seedlings need it, I stand for a good five minutes and water the same spot! It’s far better to get a sprinkler going if you have a large area though. 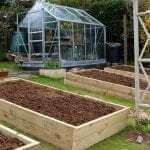 Turn it on for half an hour in the evening and the ground will be saturated enough for garden veg. Watering in the early morning and evening will help reduce evaporation. It gives the water a chance to seep into the soil before the hot sun burns it off. I like to also cover my soil with a good couple inches of mulch to keep the soil moist. I use composted manure but garden compost works as does straw in drier climates. Mulch lays on the surface of the soil and helps stop it from drying out. Mulch is also very handy when you’re potting up containers. 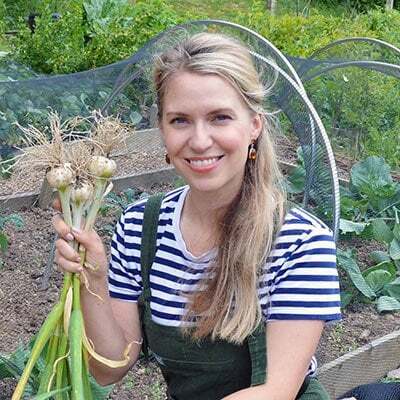 A lot of people don’t top the compost with grit and this can lead to two issues — pitting in the compost while watering and the surface compost drying out. I use a quarter-inch layer of grit on most of my containers. This goes for edibles growing in pots as well as flowers and herbs. It’s an inexpensive way to keep your potted plants hydrated and can also save a lot of water. 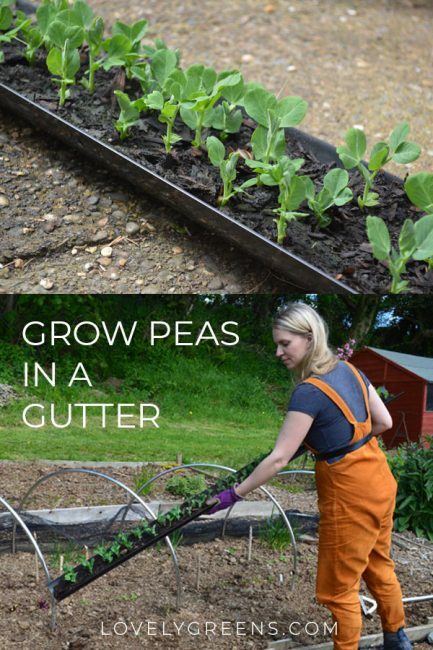 This year I’ve tried a bit of an experiment and grew my peas in a gutter. I’ve just planted them in the garden and am excited to see how they get on. Peas as a veg need quite a bit of water and while they’ve been in the greenhouse I’ve watered them daily. Now out in the garden, they’ll need less from me thanks to a protective coating of composted manure. Still, I’ll be out to make sure that they have enough moisture regularly. I’ve found that my Gardena AquaRoll M Hose Trolley set fits perfectly in the boot of my car. 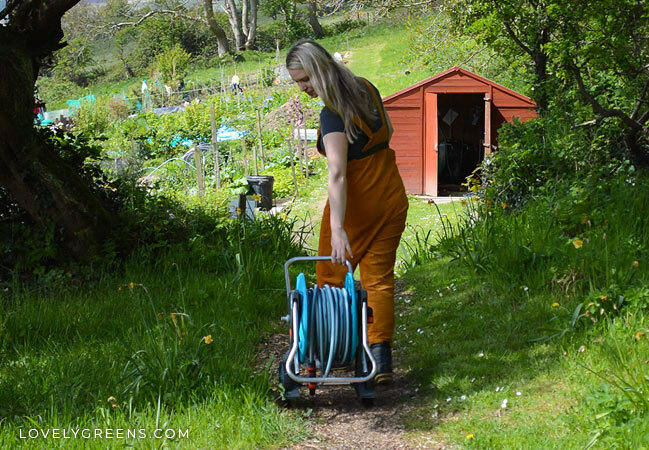 That means that I won’t have to wait on using communal hose pipes up at the allotment site. From now until August they’re always in demand but my peas and garden veg won’t have to wait.